Mrs. J.J. (Margaret 'Molly') Brown presenting a loving cup to Captain Arthur Rostron. 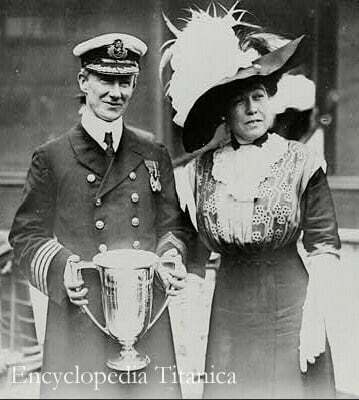 Denver socialite Margaret Brown, later known as Molly Brown, is pictured presenting a silver loving cup to Captaur Arthur Rostron, Commander of the RMS Carpathia as a token of thanks and congratulation for the rescue of the passengers from the sinking of the Titanic. It is believed that the loving cup may have been aboard the Carpathia when she was torpedoed during world war one.